Your parakeet is capable of making contented sounds similar to a cat's purring. 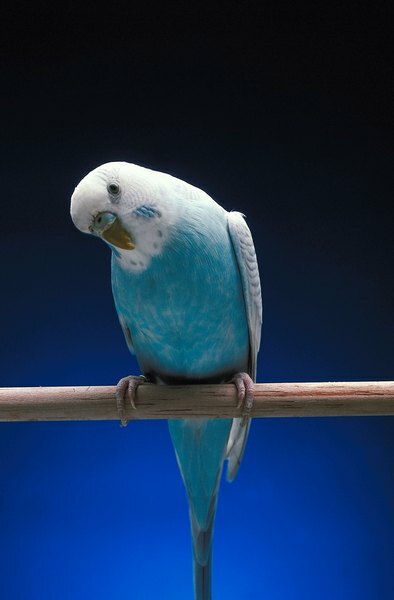 The parakeet -- or budgie -- is typically a pet that's easy to add to any household. Beyond food, shelter and water, she needs exercise, mental stimulation and security. Taking time to observe and listen to her will help you judge her state of well-being. Your parakeet should have a healthy interest in her food. Her diet should consist of not just commercial pellets and seeds, but also daily fruits and vegetables and a bit of protein. Offer a variety of tastes to tempt her palate, at least one a day, and make sure to remove any remains by the next day to avoid getting her sick. A healthy diet can help her live up to 10 years in good health. Your budgie should be sleeping 10 hours a night without waking to fly around the cage. She may grind her beak prior to falling asleep but should then tuck her head under her wing and stand on one leg while resting. Her cage should be in a quiet, dark place where she cannot be disturbed; healthy sleep patterns will contribute to her good health and overall well-being. The contented sounds your parakeet makes is her way of communicating her happiness. If she is not making any chirps at all during her waking hours, check for other signs of illness. When she's upset, she will let you know it with sharp cries of distress or anger. She may sing along with the radio or make a sound similar to purring when she is getting ready to fall asleep. A sound reminiscent of laughter -- accompanied by a bobbing of her head -- is a good indication your bird is a happy little girl. Watch your budgie as she moves around her environment. She should be alert, exploring and generally cognizant of her immediate and distant environment. Does she have an assortment of chew toys, perches, bells, ropes, mirrors or a play gym? She should spend her time climbing, swinging, hunting down treats, and being engaged in the world around her. She should have daily flight time that she utilizes flying rather than perched in her open cage. Keep her happy by assuring her safety and security; make sure she is not bothered by small children, intimidating pets or excessive activity or noise near her cage. Lisa Shea: Is My Parakeet Happy?